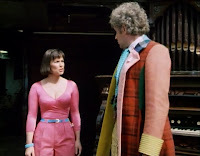 Following their critique of Jon Pertwee’s costumes in the Costumes Index on my Third Doctor Costume Blog, as well as the Eleventh Doctor Costume Index, Trine-E and Zu-Zana flounced off in disgust when The Sixth Doctor made his costume choice. So in their absence, here is my story-by-story breakdown of the combinations and variations of his costumes over his tenure as The Doctor. Initially I didn’t think they’d be much to say about each story, but even this has surprised me. I’ve also included some pointers when unusual of rarely seen parts of his costume are visible. NB. 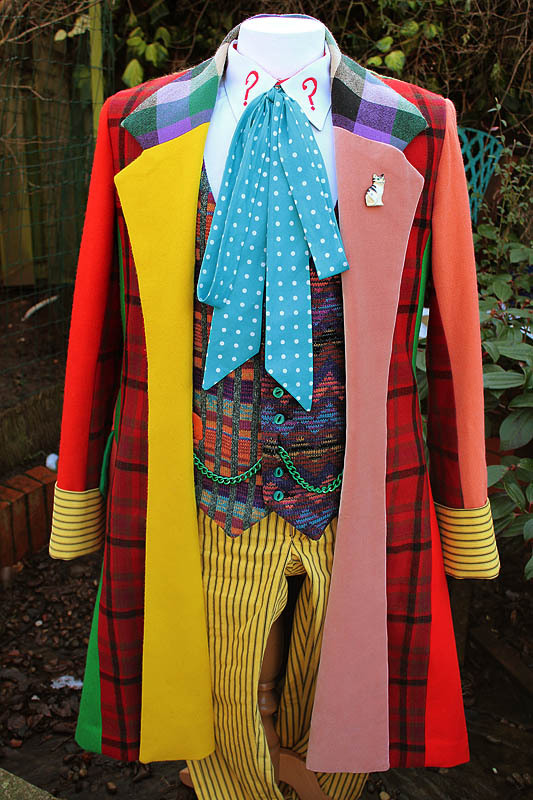 this breakdown covers as-seen costumes, and makes no distinction between multiple copies of garments made, or renewed costumes made to replace worn out pieces. 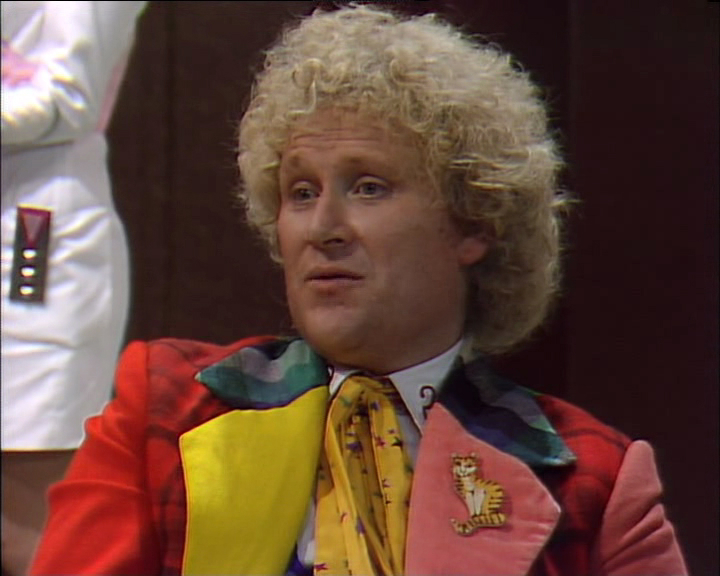 Cats: The Doctor wears a ceramic tortoise shell cat brooch. 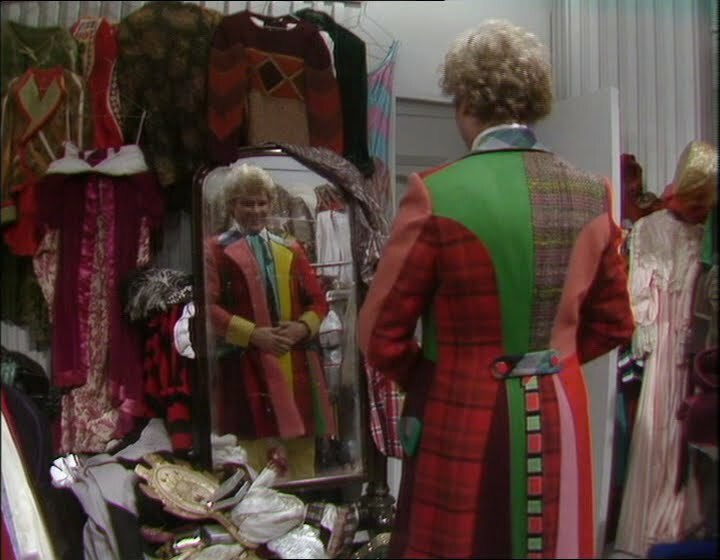 The Doctor picks up his costume from The Twin Dilemma with no changes. 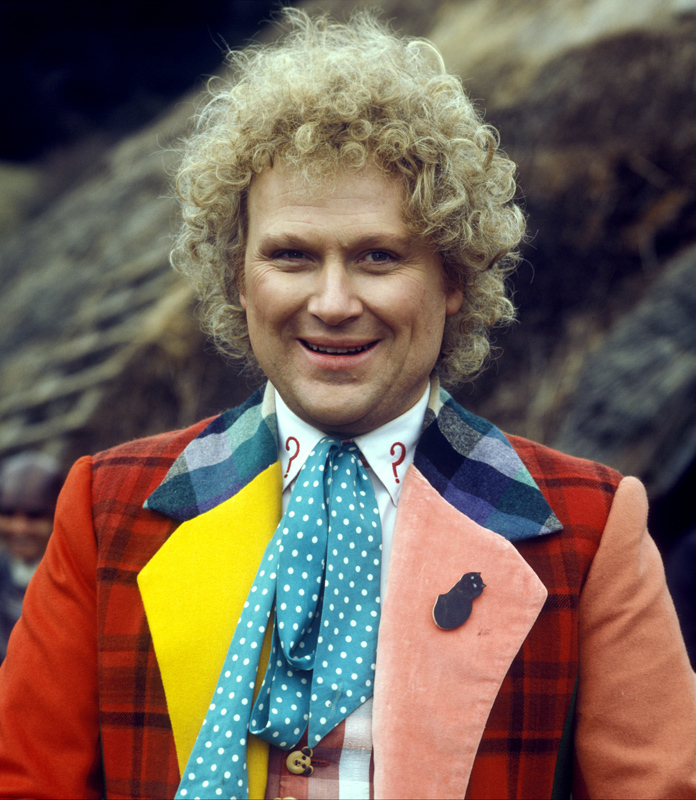 Cats: The Doctor wears a ceramic cat brooch. 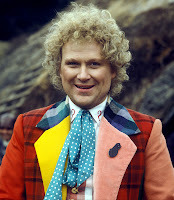 Continuing to wear his costume from The Twin Dilemma, this story is notable for the closing scene of episode one when he removes the Frock Coat, giving is a rare view of the amazing lining it has and the Waistcoat he wears underneath (see left). It is distinctive for the split tails it has at the back, which is lined with the same fabric. If you look very closely you can see a curved area to the left of the trousers in the photo. 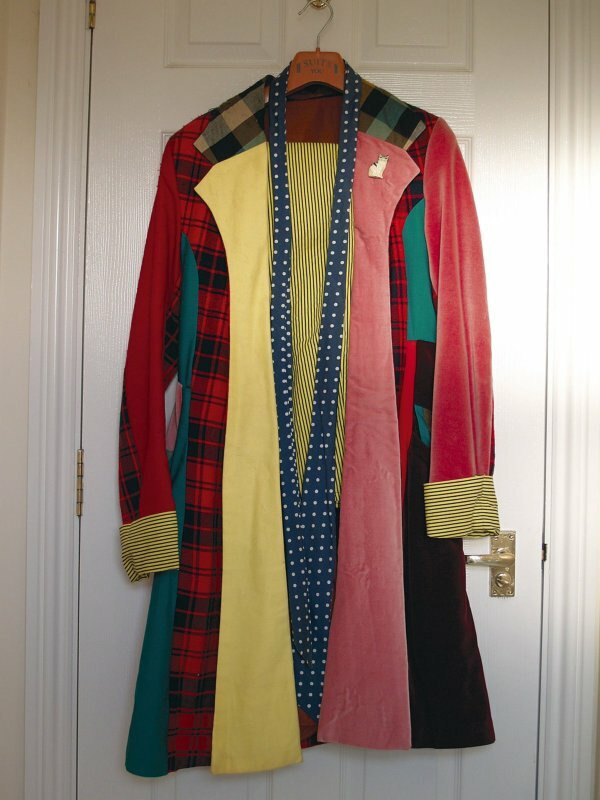 There is one moment when you see the inside of the yellow lapel, and although it is not possible to count the number of cat silhouette inside the coat, you can see the lowest is now level with the bottom of the waistcoat (see right, compared to above). That makes two. 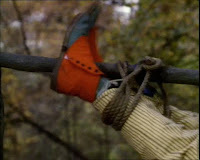 Wearing his The Twin Dilemma costume, he spends the latter part of part one dressing down in coal miner’s garb to disguise his presence. 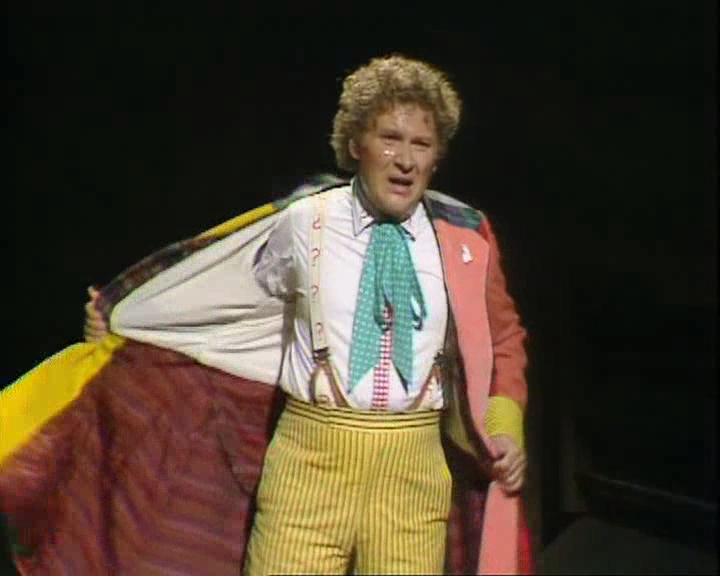 This, however, does give us some views of the costume when he is changing. 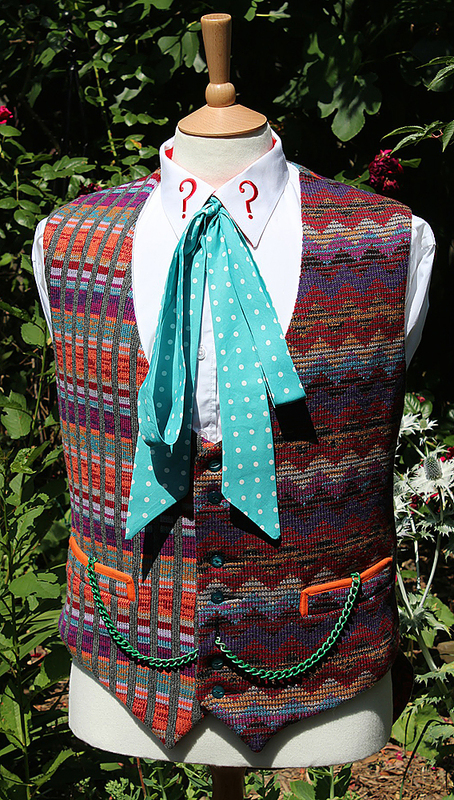 In part two, when he looses the disguise, he is seen wearing the knitted waistcoat, and we get to see its back, with pronounced tails (see above, right). Notice the way each panel alternates from squares to zig-zags, with no to panels of the same touching. 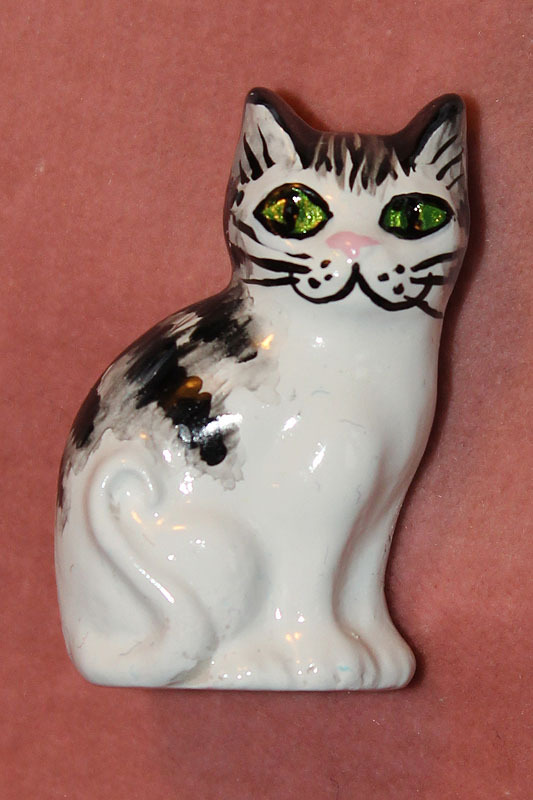 Cats: The Doctor wears a black cat brooch with an arched back and a diamond (sic) for an eye. 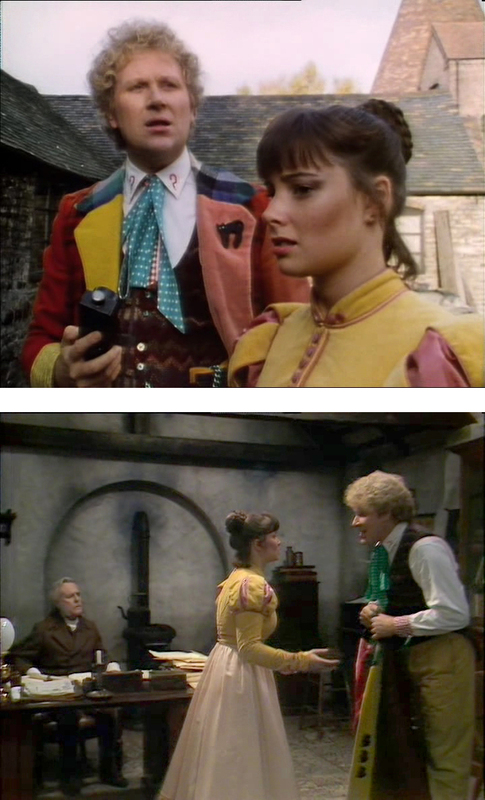 When The Doctor changes into his disguise, he passes Peri his coat, and you can clearly see three cat silhouettes inside the yellow lapel (see left, bottom). 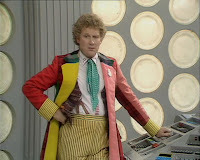 The episode opens with The Doctor casually wearing hs The Twin Dilemma combination with the waistcoat unbuttoned (see left). This gives us a glimpse of the braces previously worn by Peter Davison in Planet Of Fire. The trousers worn are not the pillow ticking ones previously seen, but are with a bolder printed stripe. For the scenes set in Spain, the Frock Coat and knitted waistcoat are dropped to be replaced by a bold Hawaiian print lightweight cotton waistcoat. It was rumored that it had been made from some of John Nathan-Turner’s Hawaiian shirts! Cats: The Doctor wears a white cat silhouette broach. There is one very brief moment when it is possible to see four cat silhouettes inside the yellow lapel (see far right). The Doctor returns to wearing his costume combination from The Twin Dilemma (see left). Cats: The Doctor wears the black cat broach with an arched back previously worn in Mark Of The Rani (see above, left). There are now five cat silhouettes inside the yellow lapel (see above, right). The Doctor wears his The Twin Dilemma costume combination, adding a blue cape of mauning for the opening of episode one. 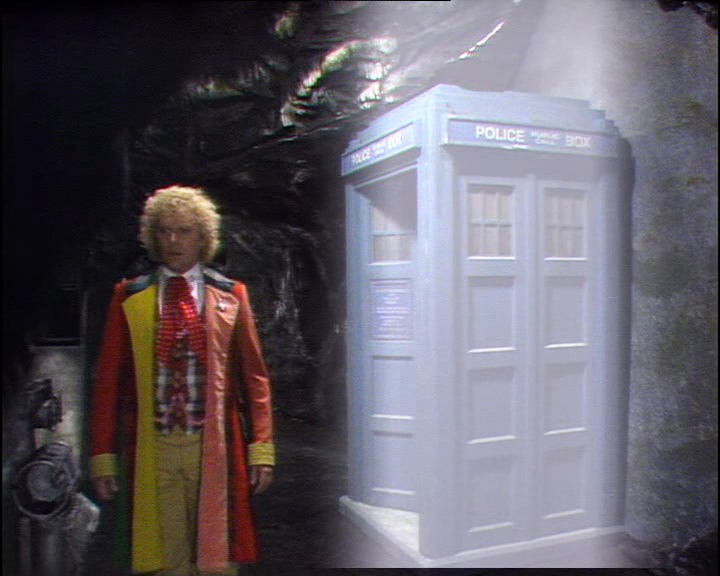 The Frock Coat takes some rough treatment during a running fight with an exiled mutant. 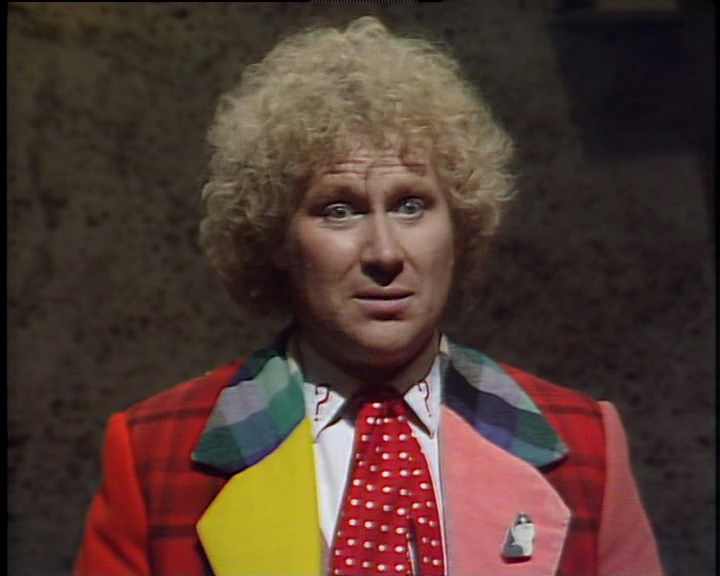 Cats: The Doctor wears a ceramic cat broach. Cats: The Doctor wears a black cat brooch, hand-painted on thin ply wood by Maggie Howard (see left). The cat is apparently modelled after Colin’s own, called Eric! 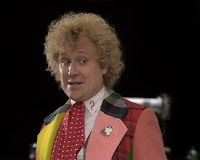 The Doctor continues to wear the new red bold gingham dupion silk Waistcoat, with the red polka-dot Cravat only seen so far in the linking trial scenes. The end of this story then links directly into the trial scenes, when The Doctor is plucked by the Time Lords at the end of part four (see left). This keeps continuity with the scenes during the previous story. 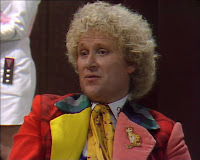 Cats: The Doctor wears a white and grey cat brooch, hand-painted on tin ply wood by Maggie Howard (see left). The cat is apparently modelled after Colin’s own, called Weeble! This story marks the only outing of a pink, purple and green dupion silk Waistcoat and the yellow star Cravat (see left). There are some scenes towards the start of the story where we get to see the Waistcoat’s back. Notice how the stripes run vertically, rather than diagonally as on the front (see right). 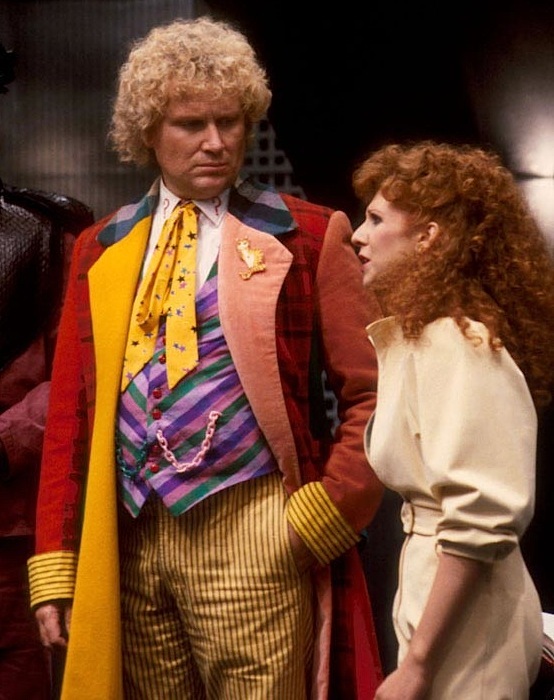 Cats: The Doctor wears a flat cartoon-like ginger cat broach (see left). Following on from the trial scenes of The Mysterious Planet and Terror Of The Vervoids, as well as the whole of Mindwarp, the Doctor is seen wearing a red version of his polka-dot Cravat with a bold red gingham dupion silk Waistcoat (see below). Finally, while writing this breakdown, I had a flashback of a long forgotten memory of when I was making my own Six Frock Coat back in 1985 (see right). I recall that it was around the time of Vengeance On Varos that I decided I wanted my own! At the time there was little colour imagery in print to work from, and I didn’t have a video recorder as yet, so I started watching the subsequent episodes with a new eye, trying to glean any tips or details I should include in my version. 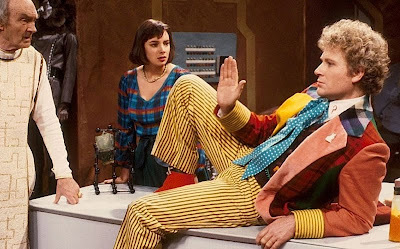 For the next story, The Mark Of The Rani, The Doctor tried to blend in with his surroundings by wearing a dirty coat for a lot of the time; while during much of The Two Doctors he left his heavy coat in the TARDIS while in Mediterranean heat of Seville. That meant it was six weeks before a the Frock Coat featured extensively. While it's well documented that the cat brooches worn in season 23 were custom-made and depicted Colin's own cats. Less well known is that the badge worn in 'Revelation of the Daleks' is a Disney badge, specifically an "Aristocats" character... 'Marie'. 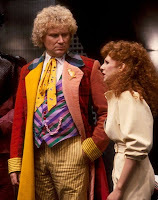 Where can I get a Terror of the Vervoids waistcoat? 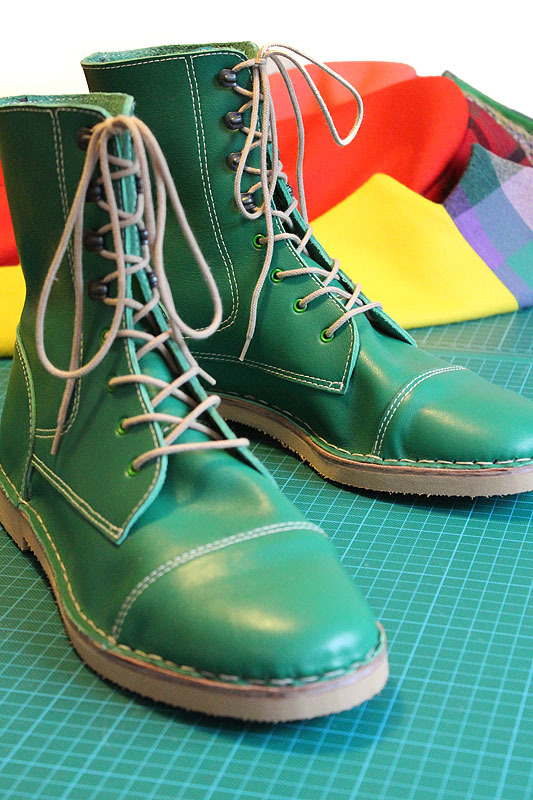 The only place I can find online that ever made them was clothears, which doesn't anymore.